Today I had the pleasure of being a guest on WMMR’s Preston and Steve show. One of their team members was struggling with a bad habit: he was habitually picking his nose. This might seem like a joke or a minor problem, but it was really bothering him — especially considering that his small children were starting to copy his behavior. So, the challenge was to hypnotize someone and change a behavior, with no preparation and no setup, in the time allotted on a live morning drive-time radio program. Being on the program was a great experience. I am always amazed at how much work is being done behind the scenes to make these shows happen. They were having fun with the topic of hypnosis, but still you could tell that they really were interested in how this could help their radio listeners and fans who have struggled with problems. 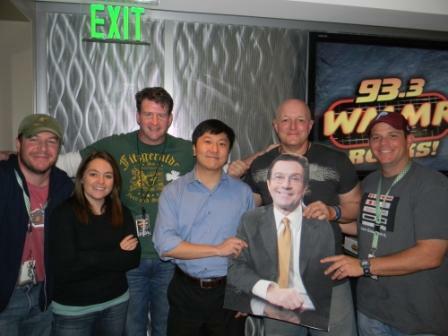 By the way, in that picture above, I am not sure why a cardboard cutout of weather guy John Bolaris is in there!